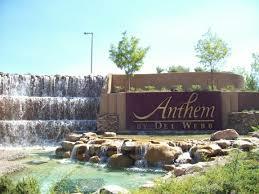 Homes for Sale in Anthem. Anthem is an outstanding 4,755 acre master planned community high in the Black Mountains, south of the city with panoramic views and world-class amenities. Driving through the tunnel past the Anthem waterfall is like entering a whole new world far removed from Las Vegas, with striking homes, designed to blend into the high desert scenery. Anthem real estate features five distinct neighborhoods. Contact Tracy Drown for real estate 702-245-9341.